Yet a couple more command stands for Hail Caesar - Pyrrhus, King of the Molossians and Harold, the Last Anglo-Saxon King of England. 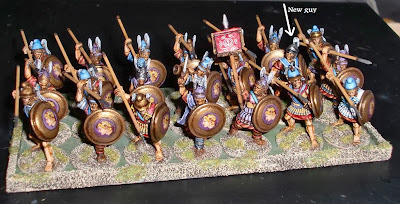 Pyrrhus is a Relic Miniatures figure and his standard bearer a Redoubt figure from their Oscan range. 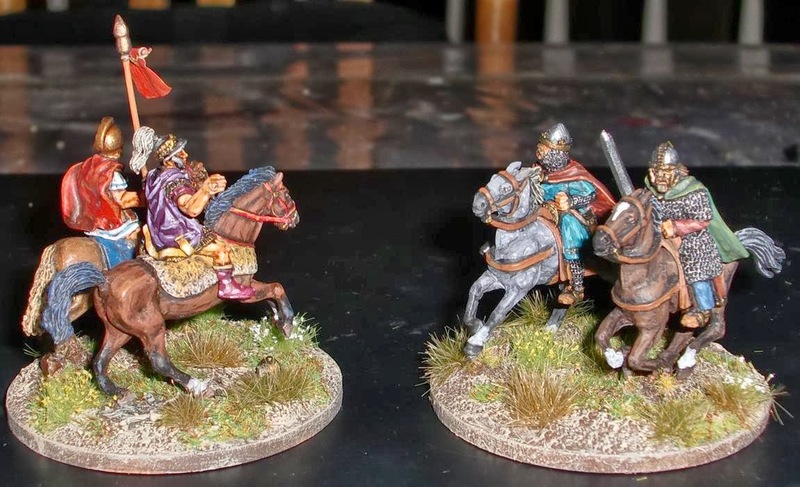 King Harold and his body guard are both Crusader Miniatures figures. All were painted a few years ago. I highly recommend the grass tufts and flowers from Army Painter - they really make enhancing bases quick and easy. They're also very reasonably priced, and the tufts come in various shades. Both of these kings met their fate on the battlefield, and were both noteworthy warriors. Unfortunately, both are remembered more for their demise rather than their feats. The Korean division commanders and a Russian brigade commander, with entourage, on 50mm Litko plywood bases. Again, all the figures were painted some time ago - but were on individual bases - which I find fiddly to move around in larger games. Army Painter grass tufts and flowers added along with static grass - which compared to the grass tufts and flowers look a bit stale and dated. 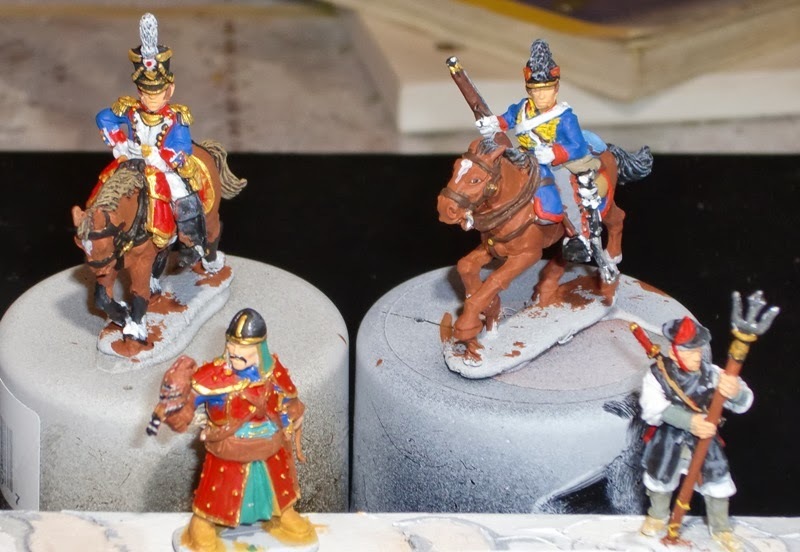 All the Korean figures are Perrys; the Russian mounted and pointing figures are Warlord Games - the bicorne wearing officer on foot is a Foundry figure. I will have to cave in and paint up a few figures to add to the Korean army general and Samurai command bases. 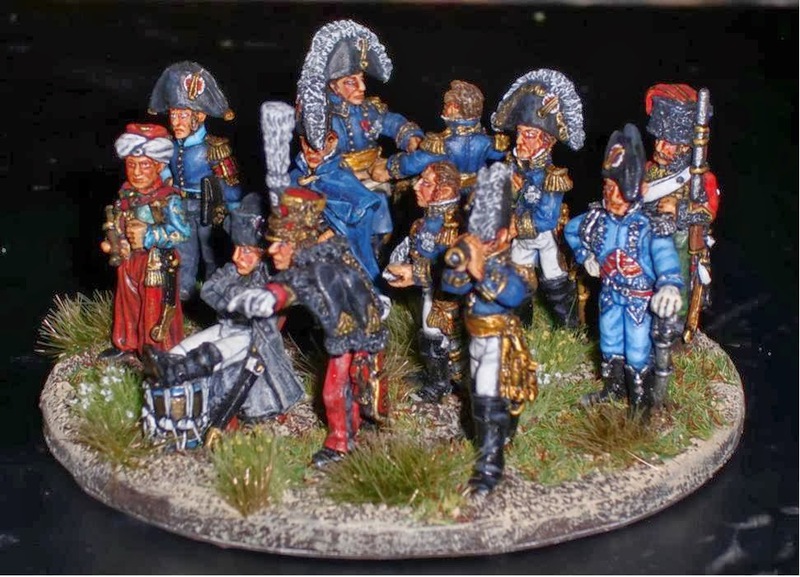 As I'm re-basing most of my stuff, figured I'd go ahead and multi-base an old Foundry set of Napoleon and his staff that had been painted several years ago. They were on washers, and it was always a hassle moving them around - never really used them in a game either. So I figured they might as well go on a large base as a group. Napoleon himself is depicted as in a painting of him watching the Battle of Borodino. The plywood base is about 3 1/4" in diameter, and was bought from Michael's. 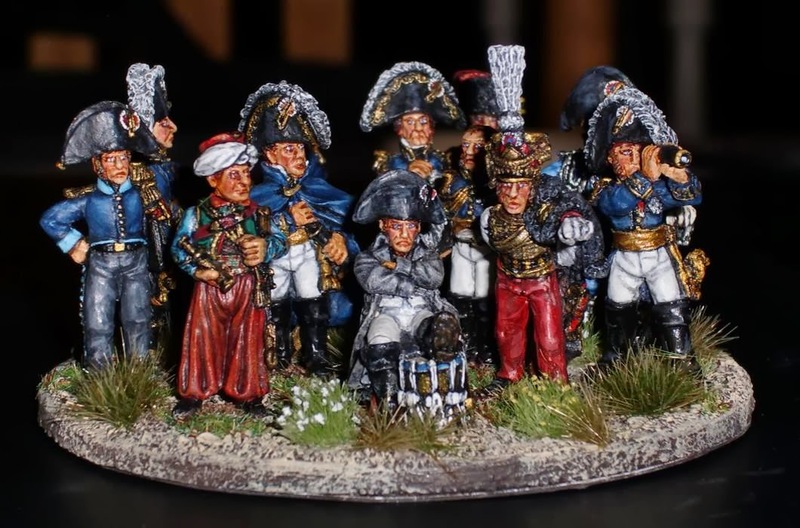 Flanking Napoleon would be his Mameluke servant, Roustan, on his right, and an ADC on Bertheir's staff on his left. Marshal Berthier stands behind the Emperor with a notebook at the ready. Other marshals and staff surround them also. The light blue uniform is worn by chief ordinance officer Gaspard Gourgaud. A Chasseur a Cheval body guard is to his rear. A couple of Marshals conduct some map reading; to their flank a division ADC as indicated by his red armband. Okay, most of these figures were painted some time ago, but I finally decided to have them based as Command Stands for Black Powder and Hail Caesar. 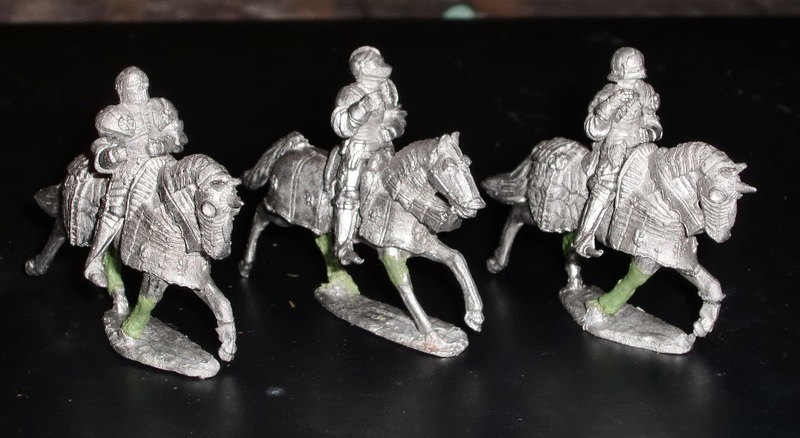 The overall army Generals are on 60mm Litko rounds - two mounted figures per base, and the Brigade/Division Commanders are on 50mm Litko rounds - one mounted and several foot per. Here are the French and British Army General stands. 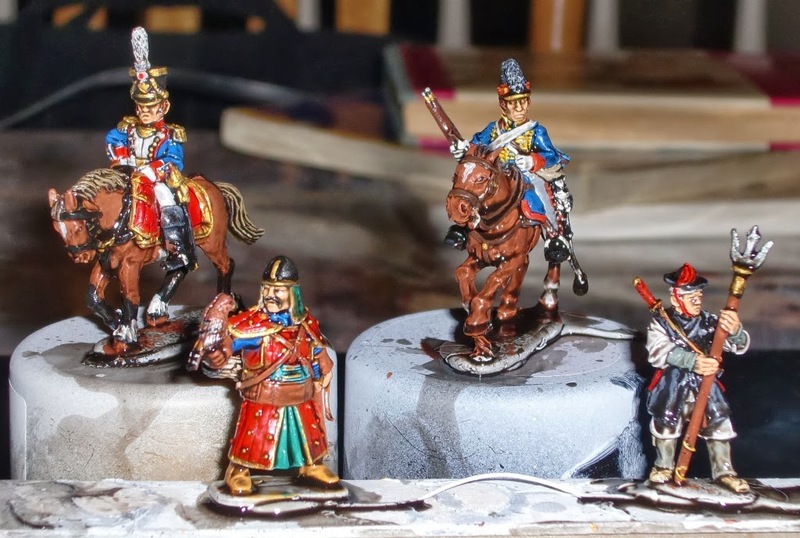 They're all Front Rank figures except for the British General in Hussar attire - he's a North Star sculpt by Copplestone. Next up, the French Brigade Commanders - the mounted figures are Victrix, save one Foundry officer in Bardin Regulation. 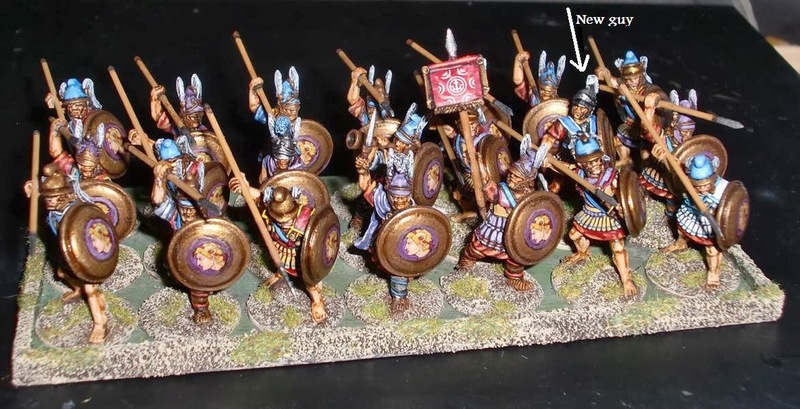 The foot figures are Victrix and Front Rank figures. Now the British Brigade Commanders - all Victrix figures; both mounted and foot. 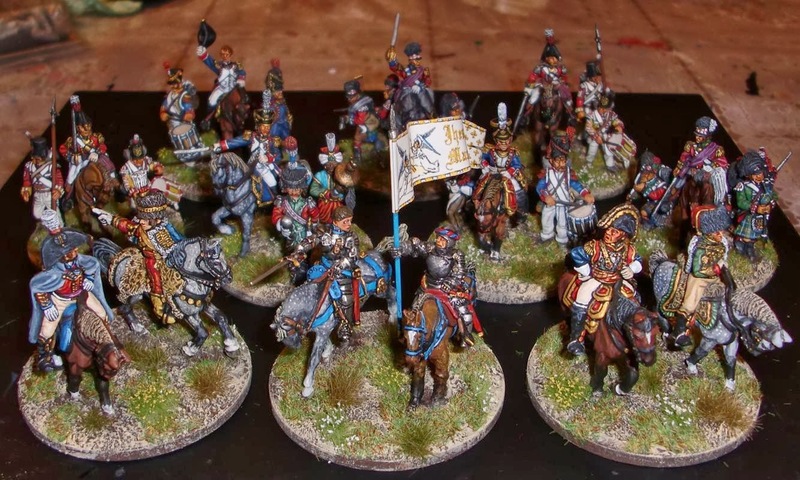 Finally, here is the Army General command stand for a French Hundred Years War army. 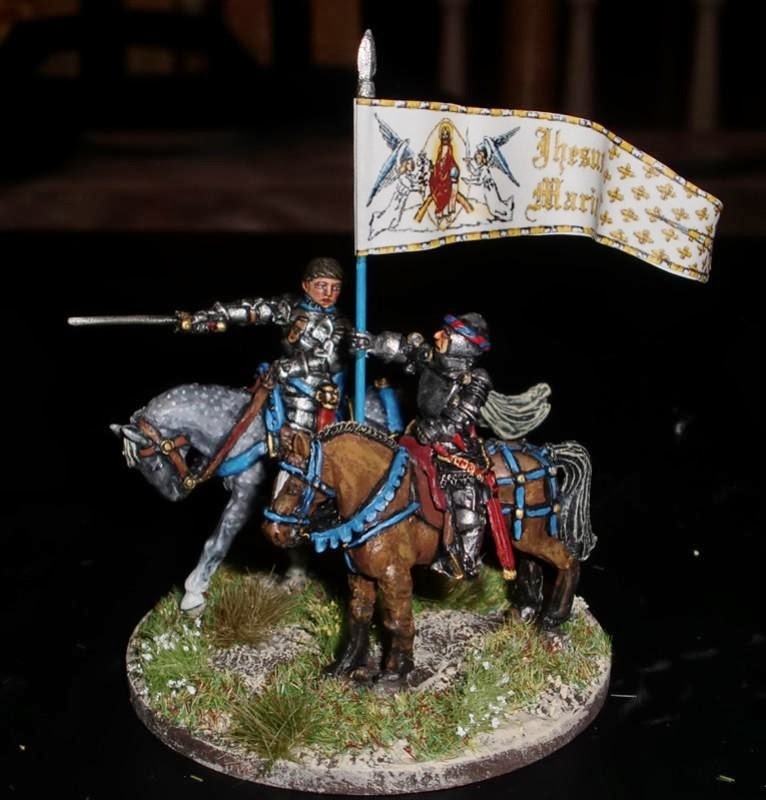 A Perry Joan of Arc and an Old Glory figure carrying Joan's Battle Standard. The standard was a graphic file sent to me by a kind TMPer a long time ago after I posted a query about the standard. Apologies for this gratuitous post of old figures, but I'm pleased with the way they turned out. First time using Army Painter grass tufts; really easy to use and adds a nice touch. Samurai and Choson Korean command stands will follow. Finished them up today. Only a few areas actually needed painting as the buffed armor areas covered most of the figures. They originally came with lances, but I didn't feel like painting them so added some spare hand arms to them. The swords are probably a bit short, but shouldn't be too noticeable once they are in ranks. Pretty simple and straight forward painting - didn't want to do anything elaborate. Besides the horse flesh, only blue and red were used; as well as a bit of gold. 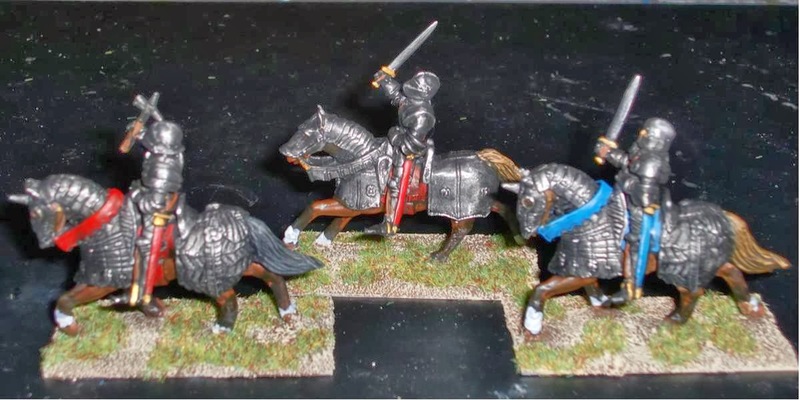 Here they are - one in each of the three units of cavalry of a Late-Hundred Years War French army. 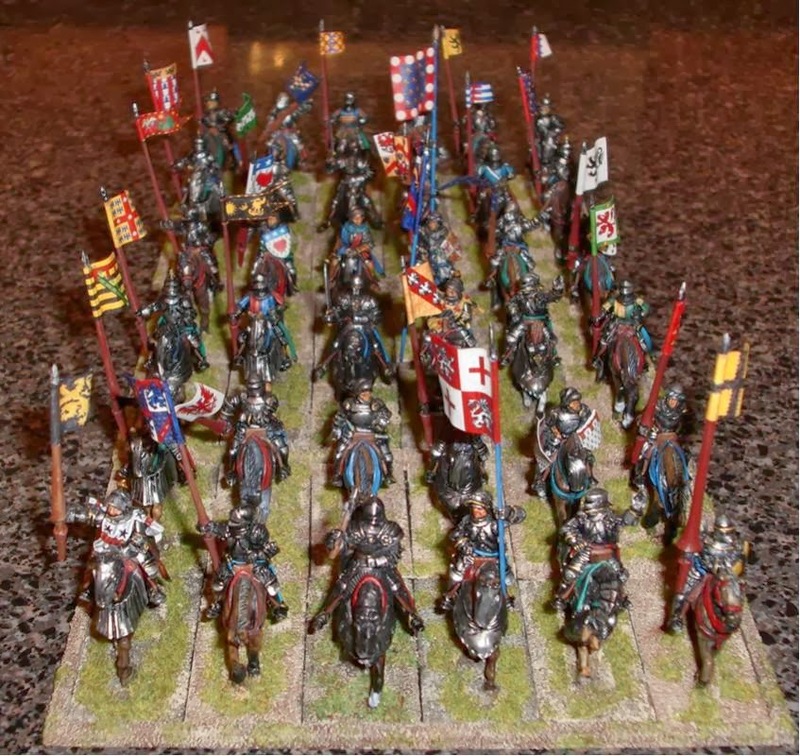 All of the other figures are Old Glory models from their Hundred Years War and War of the Roses ranges. 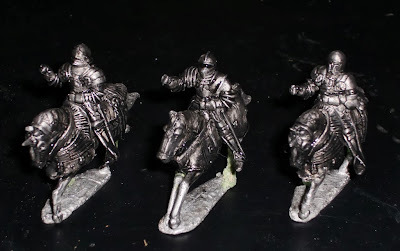 I think the are better than these Crusader models. Looks like my Litko order is on its way; I'll be rebasing various figures for command groups. For the record, I really don't have the inclination to paint much anymore. Re-basing existing figures seems to be more to my liking right now. I was motivated to do a little more work on these as I was feeling guilty eating a few plates of meatballs, followed by a bag of chips. Figured I needed to burn some calories. Dug out the old Dremel and polished up the armor on the knights and horses. A wash of Vallejo Black Ink/Stain followed to bring out the details. The metal brush was used on medium speed; it only took about 5-10 minutes to do them all. If you use this method, I would suggest following the fluting of the armor to avoid possible loss of details. Although, if you use a light touch it should be okay in any case. 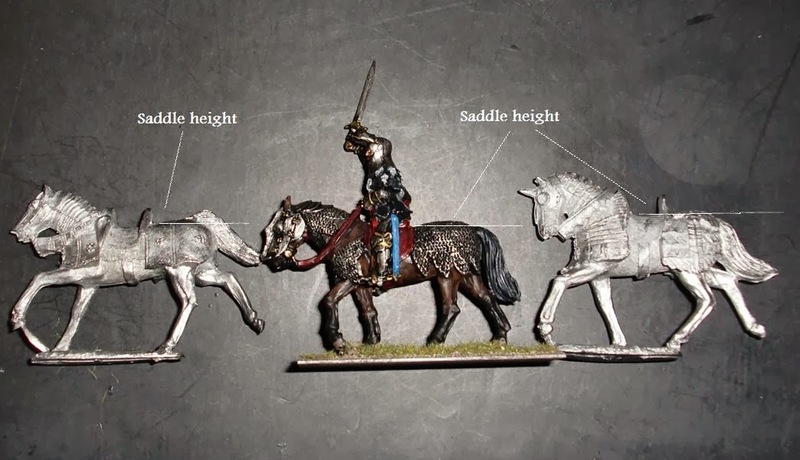 The main reason I wanted full plate knights on plate barded horses was the fact that it would only require a few areas needing actual painting. I'm quite a lazy painter. Here they are with some Green Stuff filling out the rod areas. They look okay with their riders too. Granted, not the highest quality sculpting, but should be good enough once painted and based in close order ranks. Polishing up the armor plating is next. 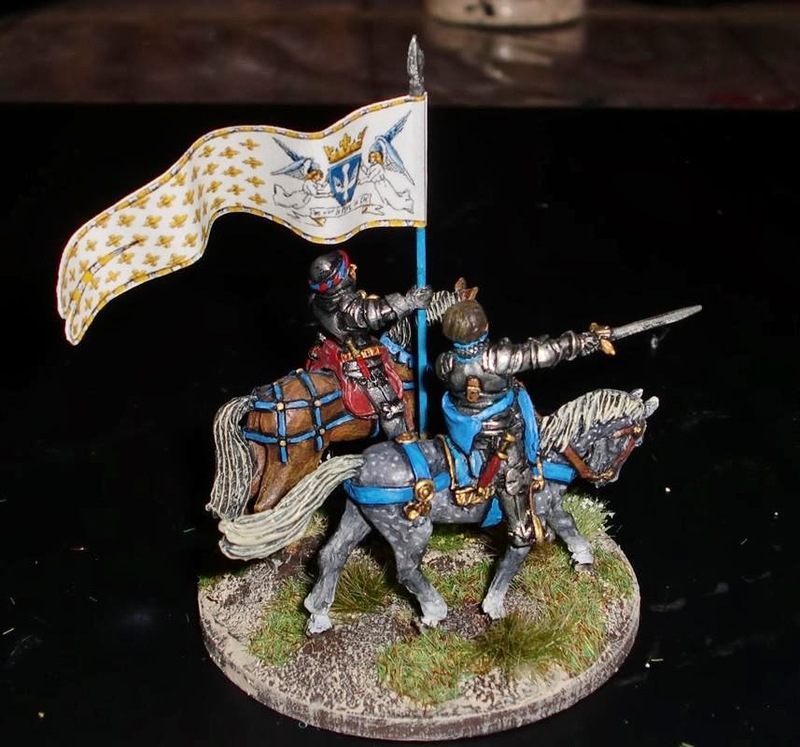 Taking advantage of a 30% off sale on selected Crusader Miniatures from Age of Glory I ordered a blister of War of the Roses mounted knights. I needed three to replace the Perry figures that will be used on command stands for a French Hundred Years War army. Although later than the period, I like the later style plate armor. The only problem was the horses are much taller than the Perry and Old Glory figures I already have for the army. 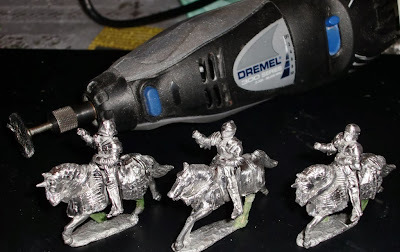 In a moment of daring, I decided to try and lower the stance of the horses by cutting sections of their legs off and replacing the space with shortened lengths of brass rod. It seems to have work, but I need to get some Green Stuff to build up the rods. The painted guy is a Perry. I think the length of their original legs were a bit out of proportion anyway - too tall IMO. Anyway, they should look okay as they'll be in ranked formation with mostly the upper areas of their bodies visible. 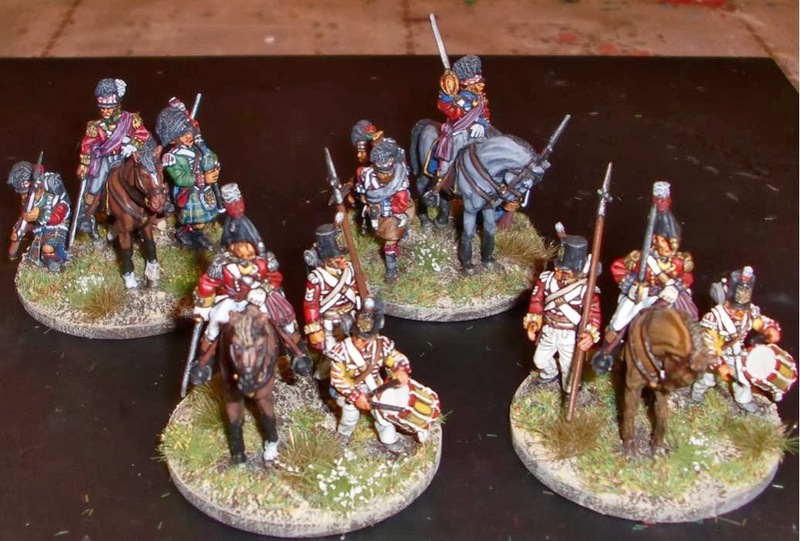 These were graciously sent to me a couple of years ago by a TMPer who said he'd never get around to painting them. Plan to use them as a small unit in Hail Caesar some day. Here they are with the usual Minwax Tudor Satin staining. This is how they looked with a basic block paint job prior to the staining.The well-defined sculpting, as well as the poses, really facilitates painting. They aren't bad figures, and would go well enough with Foundry. As it may be somewhat evident, most of my current (and future?) projects are simple ones (Minwax stain over a basic paint job). Also, the figures used are ones that are already sitting around unpainted. 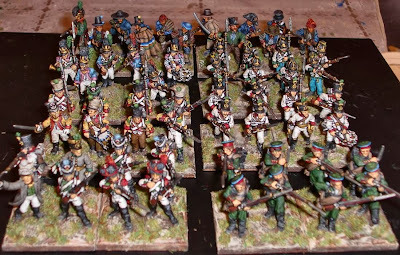 My main goal for 2014 is to host games - Hail Caesar and Black Powder mostly - using existing figures. Thanks again for visiting, and I hope you like the posts - I certainly enjoy seeing all of your blog posts, and look forward to seeing all of your 2014 projects coming to fruition. Just four figures - two foot for some Imjin War Korean command stands; and two mounted figures for Napoleonic Black Powder command stands. All of the figures have been hanging around in the bin box for some time. 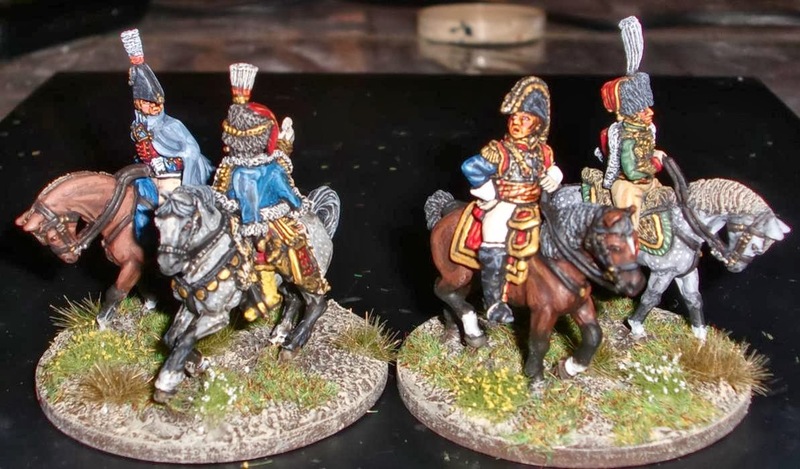 The two mounted figures are Foundry - one a French senior officer, and the other a British Dragoon wearing early-war headgear. The foot figures are a Perry Korean and a T.A.G. Chinese officer that was thrown into a TMP purchase way back when. They've all been given the Minwax stain treatment over a basic block paint job - the black areas were given some highlighting. Once the stain is dried, they'll be sprayed with Testors Dullcote - and possibly touched up here and there. 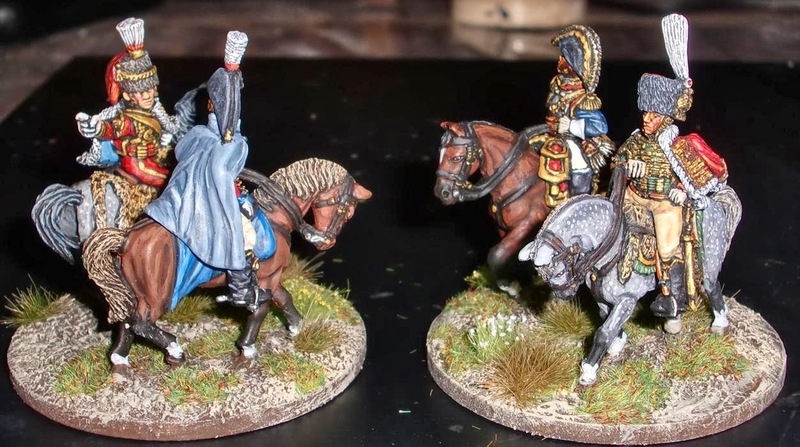 The Dragoon will accompany the overall army general for the British forces - I plan to have two mounted figures per stand for the overall army general, and a couple of foot figures accompanying a mounted brigade/division commander. Waiting on some Litko round bases for re-basing command groups. Just a single figure - a Foundry Macedonian officer that had been sitting in a bin for a few years. The shield is from 1st Corps with a Little Big Men Studios transfer. I needed him to fill out a unit of Hypaspists that has been re-based for Hail Caesar. Previously these figures had been used as singles in skirmish order for WAB. They'll now be formed infantry as a Standard sized unit. 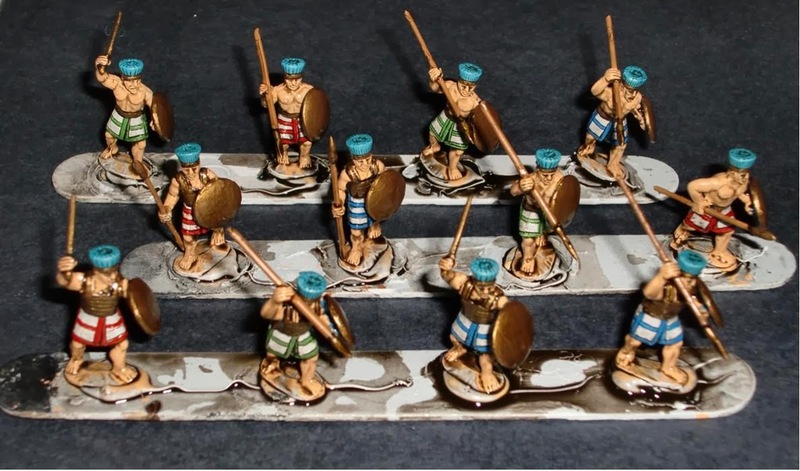 I left the figures on their metal washers as they are hard to rank up with their spear thrusting poses. 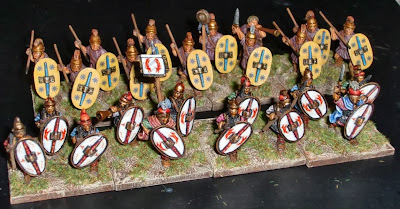 In fact, I'm re-basing most of my figures for either Hail Caesar or Black Powder. That is, I'm moving away from single based figures. Although I don't game all that often, I'm tired of individual casualty removal. This especially when I have to re-rank figures with long spears or animated poses. Hence the move to Hail Caesar and Black Powder. 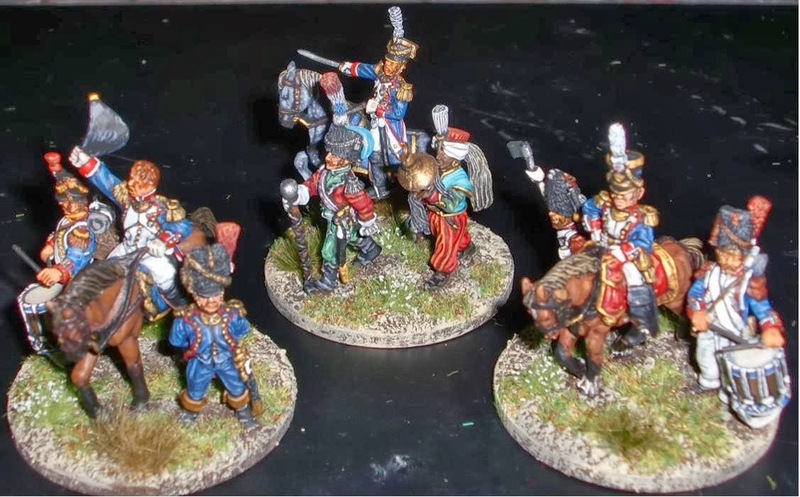 A few weeks ago I used up some left over Litko 40mm squares to re-base some Ancients and Napoleonics. 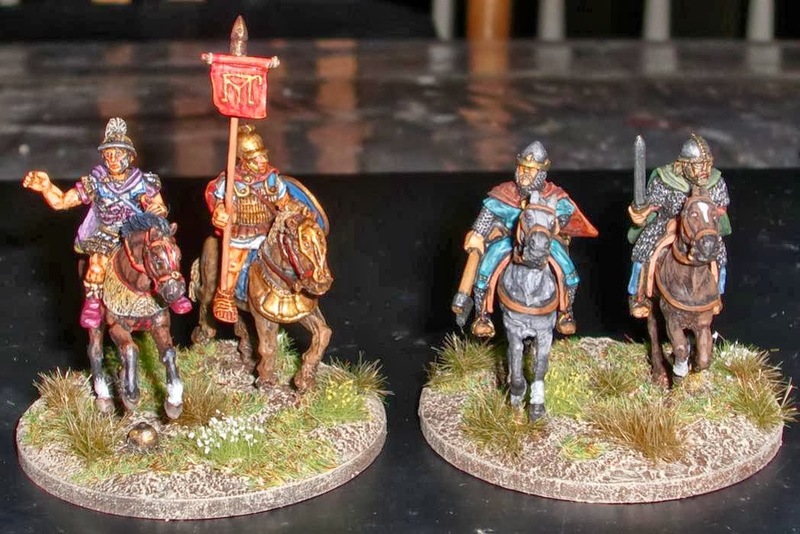 These figures were painted quite sometime ago - 2012 and earlier, so if some of you have seen them before, I apologize for the redundancy. But I do like how they now look as well as the ease of moving them now. 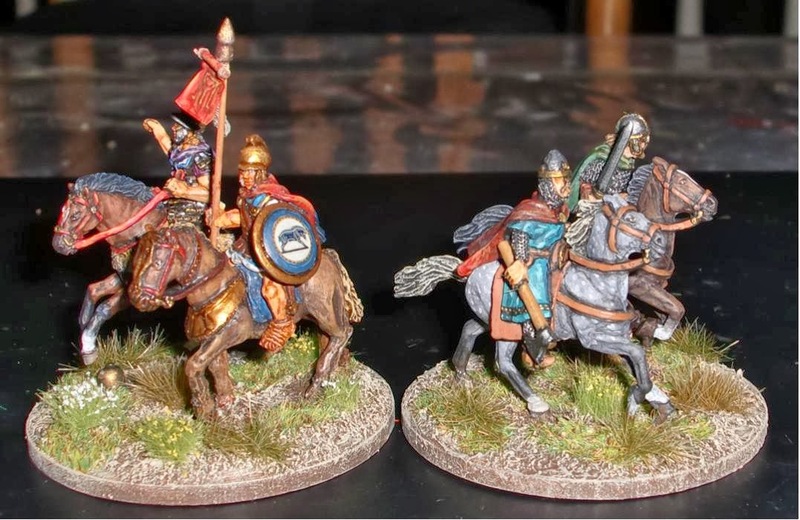 I plan to re-base more figures for Hail Caesar and Black Powder in the coming weeks for anticipated games I hope to host. I still haven't hosted the Imjin War game yet as the holidays overwhelmed most of my gaming buddies. This will have to be the first game to try out for 2014. Happy New Year to all of you, and thanks for visiting the blog.